DO NOTE: This product is specifically for use with the Omega Combat System (OCS) and does not have ammunition that causes damage on the Linden Damage System. It is intended as an inexpensive introduction to the OCS system. Thank you and congratulations on your purchase of the The Omega Concern's HK 416 D10RS Assault Rifle. This rifle is designed to allow the user to use it in a combat or role-play setting, and is designed for seamless compatibility with the Omega Combat System, the premier combat simulation system in Second Life. 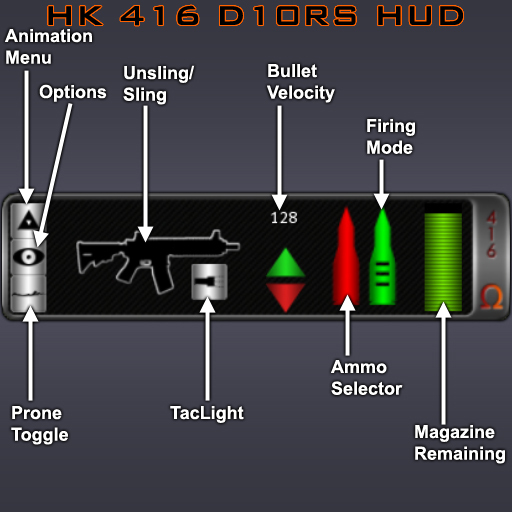 Information specific to OCS mode operation is marked with an orange Omega. HK 416 D10RS (OCS Only): This attaches to your right hand attachment point, and may only be attached there because the animations work with the assumption that it is there. In OCS mode, prone can also be toggled with the "C" or Page Down key. The "E" or Page Up key will also bring you back to a standing position from prone. While in OCS mode, you will find your movement while prone to be limited, with a forward or backward tap of the direction keys only moving you a short way. This is intentional. OCS 416: OCS compatible bullet with a mean damage of 70 points. OCS TRC 416: Same as above, but as a tracer.